East Village Association | West Town Chicago: Eckhart Park as carnival midway? Brilliant! Eckhart Park as carnival midway? Brilliant! 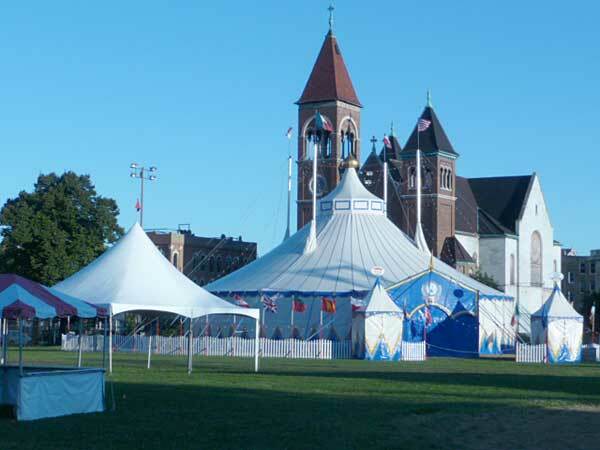 The big top pitches alongside St. Boniface Church at Eckhart Park, 1330 W. Chicago Ave.
Family Sport Festival, 11-6, Armour Square Park, 3309 S Shields Ave. Try more than 25 different sports and get information about the programs and places where you can get active in Chicago. Via 32nd Ward newsletter. East Village Association board of directors, 6:30pm at Leona's 1936 W. Augusta. Planning committee reports on Friday's meeting with Ald. Proco Joe Moreno regarding Division/Ashland development. Write the alderman. Adult Community Yoga , 6:30—7:30 pm weekly, Commercial Park, 1845 W. Rice Street; $5. 312-371-7168. 2655 N. Elston Ave. Via 32nd Ward newsletter. East Village Association, 7pm, Happy Village, 1059 N. Wolcott. Adam Burck of Wicker Park Bucktown Chamber of Commerce is guest speaker.